mardi 18 juin 2013, par jeanmarie. ZEPA 2 is the continuation of ZEPA 1, a European project which has succeeded in implementing an outdoor arts network in the area covering Southern England and Northern France, thanks to support from the cross border cooperation programme Interreg IVa France (Channel)-England, co-financed by the ERDF. 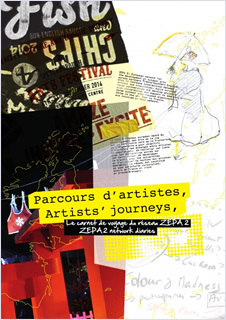 Between 2008 and 2012, the nine arts organisations involved in ZEPA 1* have facilitated the circulation of more than 65 French and UK outdoor arts companies within the European Zone of Artistic Projects and supported transnational art projects in various ways : programming, commissioning, residency, collaborations between companies, outreach. The ZEPA partners also worked with French company Générik Vapeur and Welsh company NoFit State Circus to create and tour in each of the 9 areas two large scale shows, respectively Waterlitz and Barricade . The book Over the Channel, to which many people contributed, relates these two artistic journeys. ZEPA 1 can also be considered as a laboratory for what will now be developed on the ZEPA 2 project : for example, universities involved in ZEPA 2 have initiated their discussions in 2011 ; it is also within the ZEPA 1 project that partners started to work with their local partners ("second tier" partners) on locally-based artistic projects ; and some of the ZEPA 1 events such as the Fish & Chips festival, Picnic on the Bridge or Street arts in Amiens inspired the ZEPA 2 Anglo-French events. In the UK : SeaChange Arts (Great Yarmouth), Hat Fair (Winchester), Brighton Festival, Zap Art (Brighton), Southampton City Council. The origins of ZEPA 2 could even date back to...1996, when festivals Viva Cité (in Sotteville-lès-Rouen), La Fête dans la Ville (in Amiens) and the Streets of Brighton started sharing some of the companies programmed. This project then became Art’Urb between 1997 and 2000. In 2000, the network evolved into PECA - European Centre for Artistic Creation - and supported the development of creation centres such as Atelier 231 (in Sotteville-lès –Rouen), Le Hangar (in Amiens). New partners joined in : Culture Commune in Loos-en-Gohelle, Hastings Council and Rother Council. PECA was an opportunity for organisations involved to broaden the spectrum of their activities while delivering international arts projects.